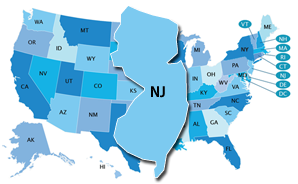 New Jersey’s state policy allows students to earn dual credit for academic or CTE postsecondary courses taken at their high school or a postsecondary institution. All public postsecondary institutions in the state are required to accept dual-enrollment credits (ECS, 2015). "New Jersey has adopted the National 16 Career Clusters Model and is implementing all 16 Career Clusters." In New Jersey, developing Personalized Student Learning Plans (PSLPs) provides an opportunity to guide students and make learning more meaningful. Plans also help students establish academic, career, and personal goals and explore options for their future. The PSLP pilot program provides an opportunity for schools to explore meaningful, creative, and flexible ways to personalize the learning environment through the development and implementation of a PSLP. New Jersey may have a state-specific Early Warning System, but the system is not publicly available.